Rebekah ‘Bits’ Allen with Emma-Lee Woods in support. Both have been key to Aussie success on tour. 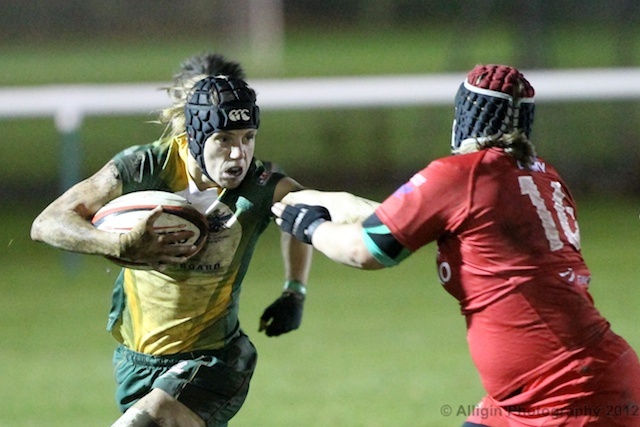 It seems along time ago that Emma-Lee Wood glided in on the left to score the first try on the UK Tour. 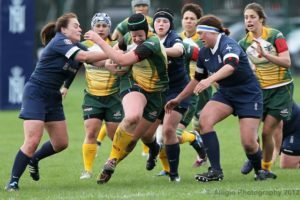 Comprehensive wins over the RAF(W) and the RN(W) allowed Joe, their coach to see all his players before picking a team to take on the challenge of the British Army Women at Aldershot. In an excellent advert for Service rugby the Warriors won through 13-10 to avenge their defeat at the hands of the Army earlier in the year at home in Sydney. The night at Aldershot was marked by the way in which the Aussie’s closed out the match and a couple of the players responsible for this have deservedly won places in the starting XV. The side selected has a formidable pack with six of the pack being strong ball carriers leaving ‘Nugget’ Bolton and Bit’s Allen to work the ball at the tackle zone. The half backs have been an unbroken partnership all tour and have shown their ability to control a game with vision and variety. The back line can attack through the powerful running of Lulu, Alisha or Chooka but if space is there then Woody and Nonga have repeatedly shown that they know the way to the goal line. Should be a cracking test match.